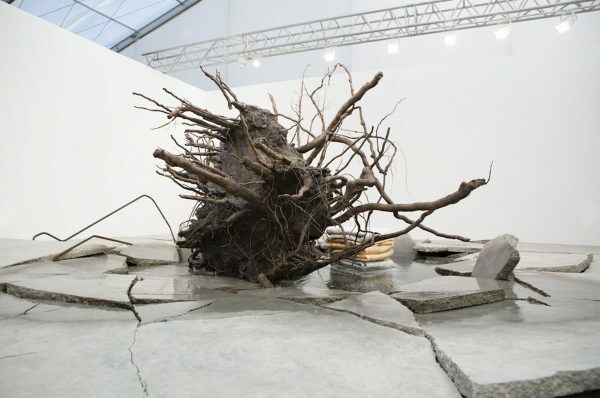 The 18 best booths at Frieze London and Frieze Masters. Brooklyn Museum director Anne Pasternak joins #metoo debate. What Judy Chicago’s work reveals about the toxicity of masculinity. Jenny Saville painting sells for $12.4 million at Sotheby’s London, breaking record for living female artist. Rare Richter’s a bust, but Christie’s moves $25.9 million Bacon & a $21 million Fontana at London sales. Christie’s to auction works by Grenfell victim Khadija Saye. The de Koonings found in a storage locker, authentic or not, will go up for sale. Russian billionaire Dmitry Rybolovlev slaps Sotheby’s with $380 million lawsuit. Even as Brexit looms, galleries notch sales on Frieze London’s opening day. Mega-galleries bank on Chinese art at Frieze. The highlights on what sold at Expo Chicago. What art dealers need to know before doing a fair. Ahead of FIAC, French dealers launch Paris Avant Première to highlight city’s emerging art scene. Kerry James Marshall speaks out about the sale of his painting by the city of Chicago. Kerry James Marshall again proves he’s among the greatest living artists. The 25 rising power players who will run the art market. Contemporary galleries start looking to the next generation. Dominique Lévy and Cheyenne Westphal discuss the current art market. The art market is finally catching up with strong female artists it ignored. Wasteful art world gets ready to clean up its act. Jerry Saltz writes an intensely personal tribute to powerhouse gallerist Phyllis Kind. Artist Mickalene Thomas opens up about the importance of diverse bodies in her work. The Haitian Surrealists that history forgot. This duo catalogued the colors of 400 flowers to help you find your favorite blooms. Impressionist painter Berthe Morisot comes into her own at the Musée national des beaux-arts du Québec. Cuban artist Tania Bruguera’s Turbine Hall installation will have visitors crying. Chimurenga named winner of Vera List Center’s 2018–20 Jane Lombard Prize for art and social justice. Art 2030 takes activist stand alongside United Nations in New York. The beatitudes of Bill Traylor’s show, currently at the Smithsonian American Art Museum. In the cradle of hip-hop, So. Bronx gallery The Compound bridges a gap with new show by Jonathan Mannion. 10 iconic photographers who immortalized the city streets. Fujiko Nakaya fills Boston’s parks with fog and shadows. Hoping to alter industry compensation standards, W.A.G.E. launches platform for negotiating artists’ fees. Harmony Korine’s “BLOCKBUSTER” at the Gagosian unearths our nostalgia for the 1990’s. Muji’s Kenya Hara curates a show of exquisite Japanese paper-work. Brazil’s National Museum launches rebuilding efforts with a temporary exhibition of surviving collection. Brooklyn Museum acquires fabric recreation of Do Ho Suh’s Chelsea apartment. Los Angeles–based gallery Regen Projects will now represent artist Alex Hubbard. JPMorgan Chase donates $300,000 to Theaster Gates’s Rebuild Foundation in Chicago. Guggenheim Museum restitutes Kirchner painting once held by Nazi collector. 6 simple things artists can do to feel happier in their studios.